Gizeh is a label which grasps the importance of the complete music experience, and never stint on their packaging. 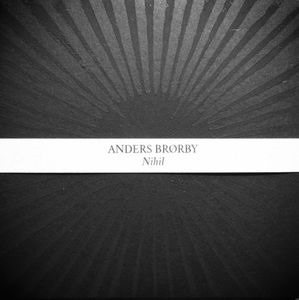 Anyone purchasing their product can feel a tangible sense of both art and artefact, and Anders Brørby’s brooding instrumental album Nihil, the second release in their ‘Dark Peaks’ series, is no exception, housed as it is in a textured gatefold sleeve, the radiating sunburst design raised from the surface, in heavy black ink on a matt black background. How much more black could it be? The answer is none. None more black (the white paper band printed with the artist’s name and album title which much be carefully slid from around the sleeve in order to access the contents notwithstanding). The presentation provides a suitable indication as to the sonic experience it prefaces. Nihil meaning nothing: while it has, since the 19th Century come to connote a negativity, manifesting as antagonism or rejection through the widespread use of ‘nihilism’, as of and in itself, ‘nihil’, or ‘nothing’ implies an absence. Neither positive or negative, it is simply a lack. Absolute nothing is beyond the human ken, and so, in artistic terms, there is a need to portray nothing, absence, with something. This is something Norwegian composer sound artist Brørby achieves on the 10 pieces which comprise Nihil. Primarily, the music is dark. There is a lack, an absence, of light, at least in terms of the overall sensation it conveys. Melding elements of drone and dark ambient with more abrasive sounds, the compositions infer an experimental bent which places atmosphere at the fore. The structures are almost subliminal, the shapes of the pieces largely evolve and emerge briefly through a succession of transitions as layers of sound overlap and drift across one another almost imperceptibly. Musical forms are therefore explicitly absent, expounding the concept of ‘nihil’. As such, Nihil is a work of subtlety, and a work which bears theoretical scrutiny, and sits alongside works by the likes of Christian Fennesz, Lawrence English and Tim Hecker. But subtlety should not be read as a synonym for sedate or tranquil. ‘As Dead as the Stars We Watched at Night’ builds layers of dark noise and swelling drones scrape and torment the nerves, and while the gentle, chimes which ripple in cadence through ‘I Will Always Disappoint You’ offer a glimmer of light and warmth, ‘Put Your Ear to the Ground’ finds a harsh, thick distorted fuzz that obliterates the smooths contrails beneath and accentuates the unrest on which Nihil is constructed. Likewise, the serrated howl of ‘From the Window Above the Lake’ conveys the anguish of emptiness. Through the medium of sound, Brørby creates a conceptual absence (not to be confused with an absence of concept). There is no message, and Brørby does not purport to convey anything through the work beyond ‘raw atmospheres’. ‘Raw’ implies unfiltered, unadulterated, without manipulation nor refinement, and while this may not be strictly true of Anders Brørby’s creative process, Nihil nevertheless presents itself as being self-contained, a work about absence of anything but the sounds it contains. It is not ‘about’ Anders Brørby, and if anything, the artist is, if not completely absent, then very much hiding in the shadows. It’s an album that’s best appreciated in a semi-present state, to allow the sounds to slowly wash over the senses and most of all, to be heard without preconceptions or expectations. Because nothing can often leave you with so much more than something.